From $100 countertop models to $20,000 backyard farms, here are five of the top off-the-shelf options. Back to the Root's "Water Garden" kit makes a great entry to kitchen aquaponics. I once built my own backyard aquaculture system, a semi-disaster which I detailed in a previous post. I wasn’t even attempting the hydroponics part, but just building a self-sustaining system to raise tilapia was a months-long slog of equipment failures and fish kills. I was trying to save money by going the DIY route, but in retrospect I would have been better off with a pre-fab model, one where professional engineers have worked out the kinks in the design. There weren’t many on the market seven years ago when I started tinkering in my garage with visions of fish tacos dancing in my head. Today, though, there are a plethora. Some are suited for raising nothing more than a couple goldfish and a bouquet of herbs in your kitchen. Others are big enough to supplement a market gardener’s income with sales of hydroponic produce and organically grown fish. Here’s a brief rundown of the options. Back to the Roots, a self proclaimed urban homesteading company based in Oakland, California, offers goods ranging from stoneground corn flakes to organic mushroom kits. They now also offer a cute little [amazon_textlink asin=’B01LZMHWF6′ text=’tabletop aquaponics kit’ template=’ProductLink’ store=’modefarm-20′ marketplace=’US’ link_id=’b48f020a-6984-11e7-8e85-918c0baf5752′] that contains everything you need to raise sprouts, herbs and a single (inedible) fish (minus the actual fish) in your kitchen window. The kit includes a 3-gallon tank, filter, pump, hydroponic growing medium, fertilizer, fish food, and a coupon for a free betta fish, a fancy-looking aquarium fish also known as a Siamese fighting fish. Educational materials are included for classroom use. Bottom Line: The kit is an easy way to get your feet wet before making a more serious investment in aquaponics. Plus, 163 customers took the time to review it, awarding an average of 4.5 out 5 stars, which is pretty impressive for such an obscure consumer product. 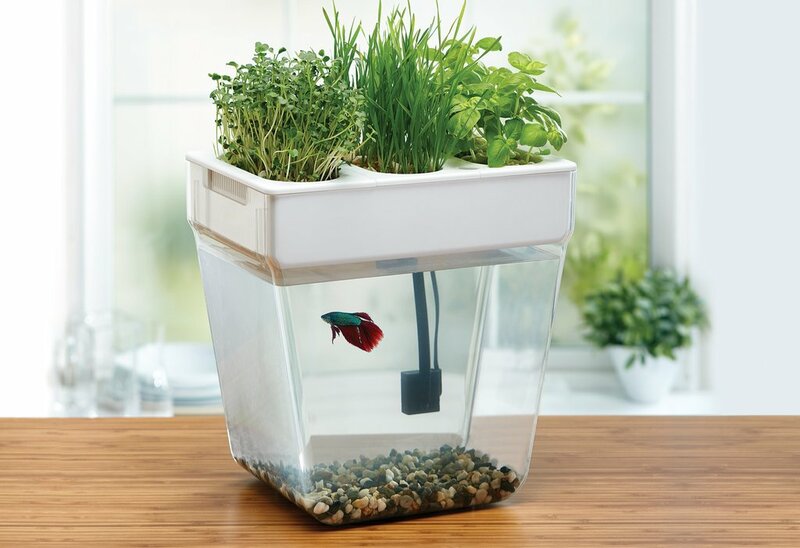 There are loads of indoor aquaponics kits on the internet these days, from wood-and-mason jar models on Etsy to one designed to look like a piece of modernist furniture on Wayfair (available in white or black only). But if you’re going to stick one in your living room, why not support a good cause with the purchase? That’s the idea behind the Eco-Cycle kit[amazon_link asins=’B00LMMNVWO’ template=’ProductLink’ store=’modefarm-20′ marketplace=’US’ link_id=’9d0f1ec9-6985-11e7-b617-d74ea5a9ba24′], which is sold to support a small non-profit that works with subsistence farmers in developing countries to help them lessen their impact on the land. It consists of a 12” by 24” aquarium with a rack of LED grow lights on top that illuminate a growing space for 17 plants. An instructional video is included. Bottom Line: It has a utilitarian look – definitely won’t fit in with your modernist décor – but I’d trust these folks to design a functional system. The price is right, and your purchase counts as a tax-deductible donation, to boot. If you want to raise more than just aquarium fish, and produce more than just the occasional head of lettuce or sprig of basil, be prepared to spend at least $1500 on a larger system for your garage, greenhouse, or garden. Aquaponics USA has some of the best-priced systems available, such as their Quick Kits, which require a few extra steps in the assembly process, but are designed to be compact and lightweight, saving you hundreds of dollars in shipping fees (most systems this size cost $500 to $1000 to ship). The basic Quick Kit includes a 100-gallon fish tank, two 8-square foot grow beds, and all the hardware and supplies you need to get started, plus free technical support. It’s enough to provide a few heads of lettuce and a filet or two each week. Bottom Line: You’ll eventually pay this system off with money saved on produce and fresh fish, but probably not for a few years, or more – especially if you don’t have a greenhouse to put it in – grow lights cost extra, and you can’t use it outside over the winter. The Mini Fish Farm is one of the slickest turnkey systems out there. It is designed to keep the water clean with or without plants, which is handy if you happen to lapse in your planting regimen. The 400-gallon tank is big enough to provide enough fish for a large family on a weekly basis. And its plexiglass window, which allows you to view the fish within, is unique among larger utilitarian-style aquaponics systems. An extremely energy-efficient design, this model runs on just 60 watts, adding only about $4 to your monthly electricity bill. The system is big enough to provide a steady supply of food for a large family, though it occupies less than 50 square feet of space. Bottom Line: This is a miniature version of Pentair’s commercial-scale aquaculture systems – and is likely the most state-of-the-art system you’ll find for home use. Most commercial-scale aquaponics systems are custom-built, but if you have some cash to put into a new farm enterprise, this company makes it easy for you. Within a year, you can harvest nearly 1,000 pounds of fish and over 10,000 heads of lettuce, quickly paying off the investment while giving up less than 1500 feet of space on your property. The Family Farm Market Aquaponic System requires an estimated 4 to 6 hours of labor per week to operate and maintain, leaving you plenty of time to focus on other farm tasks. Should you choose to expand, the company has even larger models that produce up to 15,000 pounds of fish and 250,000 heads of lettuce annually. Those system cost about $200,000 and require a full-time employee to operate. Bottom Line: Likely the largest turnkey systems you’ll find, these are commercial grade products that should easily pay for themselves within a year or two. But they also need a heated greenhouse to perform at their maximum capacity.